It’s Amelia Earhart Day and here at Quirk Books we’re not only celebrating the birthday of this magnificent groundbreaking aviatrix, we’re also basking in the splendor of the brilliant courageous women who came before and after her. Each of these women brings her own remarkable twist to the history of aviation and we’re thrilled we have the opportunity to share their stories with you today. Happy Amelia Earhart Day, y’all! In 1932, Amelia Earhart made history as the first female aviator to fly solo across the Atlantic Ocean. This feat earned her the U.S. Distinguished Flying Cross, a medal presented by the U.S. Armed Forces to an officer who displays extraordinary heroism in the field of aerial flight. Earhart is one of only eight civilians to receive the medal. In her lifetime, Earhart broke several speed and altitude records, in addition to being the first woman to fly non-stop across the United States and the first person to fly solo from Honolulu, Hawaii to Los Angeles, California. In 1937, Earhart disappeared while attempting to circumnavigate the globe with crew member Fred Noonan. Over the years, many theories have arisen about the pair’s disappearance, but no one has been able to definitively determine what happened to the pair. Bessie Coleman endured years of debilitating work as a laundress in Waxahachie, Texas and a manicurist in Chicago before finding flight. As a laundress, Coleman was faced with a humiliating task – leaving clean laundry on her white clients’ back porches to avoid being seen by the neighbors. When every flight school in the United States rejected Coleman because of her race and gender, she moved to France in 1920 to enroll in the Ecole d’Aviation des Freres Caudon at Le Crotoy. 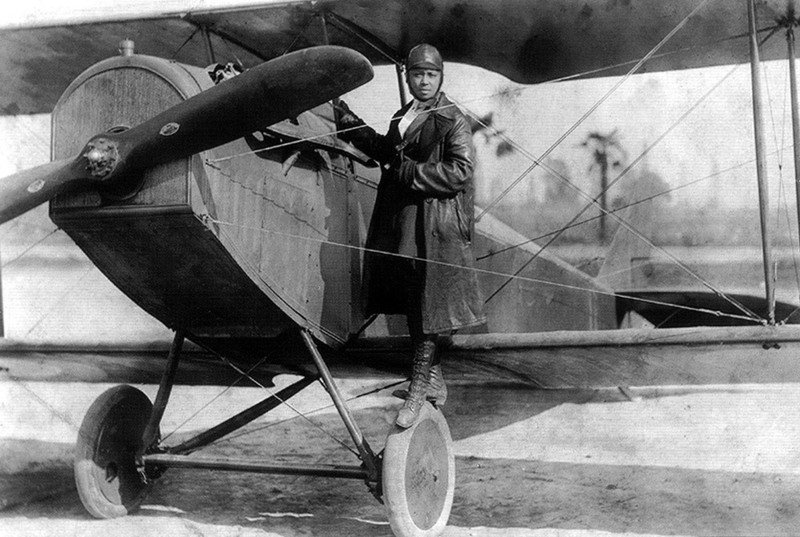 In 1921 at 29 years old, Bessie Coleman became the world’s first Black aviatrix – two years before Amelia Earhart! She then went on to become a licensed air show pilot in the United States and had plans to open a school for aspiring African American pilots. Sadly, her life was cut short at just 34 years old when she died testing one of her planes. But her legacy lives on. In 1992, Mae Jemison, the first African American female astronaut in space, carried a photo of Bessie Coleman on her first mission as a reminder of the incredible feat this woman achieved. In 1931, 27-year-old Katherine Cheung – born Zhang Ruifen in the Guangdong province of China – already had two young children when she decided to take her first flying lesson. At the time, only 1% of licensed American pilots were women. 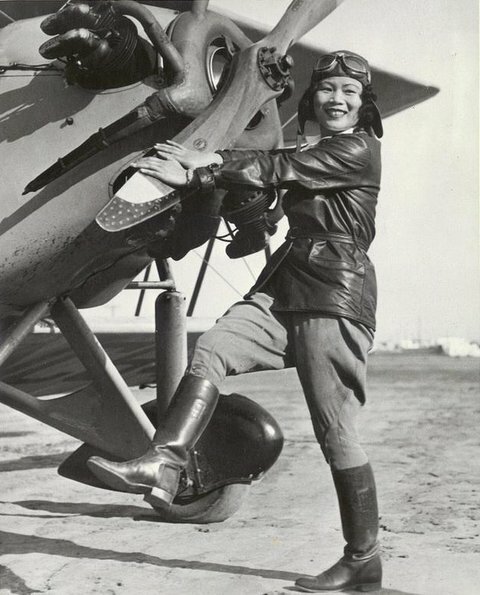 Cheung enrolled in the Chinese Aeronautical Association in Los Angeles and became the first Chinese woman to earn her pilot’s license in the United States. After earning her license, Katherine Cheung continued to study with military pilots to learn the aerobatic side of flight, such as barrel rolls, inverted flying, and loops. We’re getting dizzy just reading about it, but Cheung reveled in the danger of it all. Cheung began performing in aerial shows along the California coast almost immediately after earning her license. During World War II, she became a flight instructor, but when the war ended she bought a flower shop, officially retiring from the world of flight. Katherine Cheung lived a long and fulfilling life, passing away at 98 years old. In 1964, Jerrie Mock became the first woman to fly solo around the world – a feat she accomplished in a single engine monoplane christened the Spirit of Columbus. Mock wrote about the journey in her book Three-Eight Charlie, giving readers a glimpse into the adventurous life of a pilot. Jerrie Mock began taking flying lessons at 32 years old and had three children at the time of her global circumnavigation. While Mock was regularly referred to as the “flying housewife,” her skill and determination show us she was so much more. When she caught wind that another female pilot was preparing for her own solo flight around the world, Mock moved her takeoff up by two weeks in order to complete her route before pilot Joan Merriam Smith. In 1964, President Lyndon B. Johnson presented Jerrie Mock with the Exceptional Service Decoration, awarded by the Federal Aviation Administration. Jerrie Mock’s legacy lives on and the Spirit of Columbus now hangs in the National Air and Space Museum in Dulles, Virginia. In 1986, pilot Beverley Bass made history as the first female captain to fly for a commercial airline. Six weeks later, she led historic American Airline Flight 412 – the first flight in U.S. history with an all-female crew in both the cockpit and the cabin. The seven women, including co-pilot Terry Claridge and flight engineer Tracy Prior, traded amongst other American Airlines flight staff in order to create the historic all-female crew. History seems to have a tight hold on Captain Bass because this isn’t the least of it. On September 11, 2001, Bass’ flight was diverted to Gander, Newfoundland in Canada along with 37 other planes, essentially doubling the population of this small town. Bass and her passengers were detained in Gander for five days, embraced like family by the citizens of the town. Musical theatre fans will recognize Beverley Bass from the Broadway show Come From Away, where actress Jenn Colella plays the pilot on stage eight shows a week. In August, Kayla Barron, Loral O’Hara, Jasmin Moghbeli, and Jessica Watkins will all begin a two-year astronaut training program at NASA’s Johnson Space Center in Houston, Texas. NASA’s acceptance rate for the training program is 0.065%, making these brilliant fearless women the absolute best of the best. Upon completion of the two-year program, these future astronauts will be assigned to work on the International Space Station, the Orion spacecraft, or one of two commercial spacecraft currently under development in the United States – Boeing’s CST-100 Starliner or the SpaceX Crew Dragon. Houston, we have absolutely no problem with this. Hungry for more about Bessie Coleman and other adventurous women? Check out Wonder Women: 25 Innovators, Inventors, and Trailblazers Who Changed History by Sam Maggs.